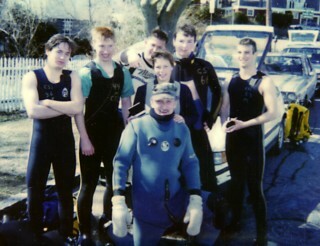 Jonathan (far left) after his checkout dives, 1988. It all began in 1988 when I realized that I needed a couple of gym credits to graduate from college. While looking through the course catalog at softball or volleyball, I came across scuba diving. I could get college credit learning to dive! I took the course over a winter semester, and soon spring arrived. To finish the course, I had to complete five open ocean dives. We headed up to Rockport, MA on a chilly March weekend, and I did my dives…29 degree water in an old rental wetsuit. (My instructor was a famous New England dive instructor named Jerry Comeau, who was conspicuously wearing a drysuit!) Even though I was freezing, I instantly fell in love with the underwater world. I watched a lobster walking around on the sand, followed a flounder for a while, and saw moon snails burrowing. An amazing world I never knew existed unfolded before my eyes, and I was hooked. By the time I graduated from college with a degree in electrical engineering, I had already combined my new hobby with my old one: photography. I was shooting with a Nikonos V 35mm underwater camera and making images of the underwater world of New England. After graduation, I got a job working as an engineer at a large defense contractor. I enjoyed electrical engineering, being basically a geek at heart, but the ocean continued to call me. I put together a slide show about the North Atlantic that I began taking around to schools, and giving talks about the amazing life living in the North Atlantic. I liked showing kids all the weird and wonderful creatures in the ocean, and impressing upon them the need to protect ocean resources. I had to take time off from work during the day to give these talks, and then make the time up at night, and it started to get difficult. I began to dream about other ways to share my enthusiasm that weren't quite so time consuming. In the early 1990s there was a revolution in video. That's when decent quality small Hi8 camcorders started to become available for a reasonable price, and companies started making underwater housings for them. I saved my money and bought a small video system for underwater work, and some basic editing gear (a couple VCRs and an editing controller to hook them together….nothing fancy like the editing computers we have now!) Over a summer, I went out and shot a video version of my North Atlantic slide show and edited it together into my first film, called Beneath the North Atlantic. I was very proud of it, but as a first effort, it really wasn't very good. I sent it to a distributor and they told me it needed a lot of work. My second edit of the film was accepted for distribution by an educational film distributor that specialized in selling films for use in schools. Now my message was getting out there without me having to physically trek to each school personally. And at the same time, I caught the underwater video production "bug." I wanted to make more films. I started saving up my money and going on vacation to dive and work on my own little educational films. With some diver friends of mine, Tom Krasuski and Rick Doyle, we formed Oceanic Research Group in 1991 as our production company for producing these educational films. (It became incorporated as a non-profit 501(c)(3) in 1993). The more films I made, the better I got at it. I read books about video, watched other films for inspiration (my documentary hero is Howard Hall) and practiced. Soon, my films were getting pretty good and I was asked to be a host for a kids show about underwater life on a now-defunct network in Massachusetts called MCET (Massachusetts Corporation for Educational Telecommunications). This was a huge awakening for me because I got to sit in a real editing suite with an experienced film editor, working with my footage to create segments for the show. I learned a great deal by asking questions and watching. I learned what they call different kinds of techniques that I had learned by carefully watching the editing of TV shows and documentaries, but never formally studied. I realized that I had a gift for photography and video production….it came naturally to me. The other thing that happened at MCET, by far the most important thing, was that I met Art Cohen. Art was producing my show. He was an experienced TV producer that had worked for years in big networks, but got scooped up my MCET because they needed someone really good to make their shows as well-produced as the “big guys.” He looked at my footage and thought it was exciting and fun to work with. Together, we created my series for MCET (called The World Beneath the Sea) and had a great time doing it. We became good friends. Art was also a freelance producer for a local news magazine television series in Boston called Chronicle produced by WCVB, the ABC affiliate in Boston. He thought a Chronicle show about the waters off New England would be of interest to the viewers of the show, so he pitched it to the executive producer of the series. They had worked with Art for many years and trusted his judgment, so they gave us the OK to make a half-hour show. I quit my engineering job to become a full-time underwater cinematographer. It was liberating but frightening. In order to explain this to my dad, who was not pleased that I spent 4 years in college in a degree program so that I could become a dive bum, I enrolled in a masters degree program, studying Ocean Engineering at UNH. They were impressed enough with my resume that they gave me a generous scholarship as well. So I went back to school as well as quit my job. But my heart was in the sea—with a camera. Through WCVB, I met Tim Geers, a news cameraman who ended up working with Art and I on the Chronicle show because they needed some shots of me underwater and Tim was the only cameraman at the station who was also a diver. Am I glad for that! Tim of course became “Cameraman Tim” and one of my best friends. Jumping forward a little...in the pilot episode of Jonathan Bird's Blue World we did a segment about Ginnie Springs in Florida and we realized that it would look to the audience like I was diving alone. We didn't want anyone to think that, so I pointed out in the narration that I was diving "with my cameraman, Tim." Even though the audience didn't see him, he was there as my dive buddy, also running the camera. We got a piece of fan mail from a young viewer who suggested that he would like to be "Cameraman Tim" so he could dive with me. And from that point on, his screen name was Camerman Tim, and this spawned all the goofy screen names we now use. Soon, I was sitting in an editing suite at WCVB with Art and an editor, editing the show. Art is an exceptional storyteller, and video is all about telling a good story. Having good footage is important, but telling a good story is more important. (People are more willing to watch a good story with poor footage than a boring story with great footage--but of course the best option is a good story with good footage!) Art is a master of looking at a bunch of footage and finding the interesting story in it. As an underwater cameraman making educational videos, I really had never given much thought to the idea of story telling. Together, Art and I made a good team. He didn't dive, and in fact actually doesn't even like boats, but he could tell a good story, and loved working with underwater footage. I could shoot the footage. Together, we made a fantastic Chronicle show called Underwater New England. When it aired, it got great ratings. Later it won an Emmy Award. Art and I stood together on stage to accept the award, thinking we definitely made a good team. So good in fact, that we needed to keep working together. Tim, Art and I produced several more Chronicle shows (one of which called Summer of the Shark about sharks in New England won another Emmy for Best Cinematography) but we also decided to do an hour-long television documentary. In 1994, ORG co-founder Tom Krasuski and I shot the film, called Sharks: The Real Story, and Art wrote and edited it. I learned an incredible amount about filmmaking by working on that film. Art had become my mentor. He taught me how to write for the screen, how to conduct and edit interviews, and how to tell compelling stories that engage viewers. When the film was done, it aired nationally on public television and got great ratings. It put us on the map. We weren’t big on the map, but we were on there. I was by that point fascinated with natural history filmmaking, and eager to make another film. In 1997, Art and I took out a loan and spent what was to us an incredible amount of money at the time ($25,000) to buy a Media 100 editing system, one of the first broadcast-quality computer-based editing systems. (The Avid editing system was also available at the time but we couldn’t afford it!) We followed up the shark film with an hour-long documentary about the north Atlantic, to which we gave the same name as my very first educational film: Beneath the North Atlantic. This film sold incredibly well in the international market, and actually made a profit. Art and I were on a roll. During the production of Beneath the North Atlantic, through the magic of a relatively new thing called the internet, I met a guy named Greg Brunshidle who was an up and coming underwater cameraman in Chicago who came to Maine to help me shoot some sequences for a few weeks. We became great friends and he ended up working with me on several films. During an expedition in Florida where we were shooting manatees, he chased an alligator, trying to get a shot of it, and somehow got the nickname "Gator" which stuck. Throughout the evolution of my early video-producing years, I never lost interest in my first love—still photography. I took a 35mm still camera everywhere I went, shooting pictures along the way. In 1996, my first book was published. Not coincidentally it was called Beneath The North Atlantic and contained the best images I had shot around New England for the most part. There are even a few pictures in there from my early school slide-show days. At least one picture in that book came from my second or third roll of underwater pictures ever. But it wasn't all easy going. We had some tremendous setbacks along the way. Making documentaries is expensive and neither Art nor I was ever very good at fundraising. We funded most of our own films so we always had to work on a low budget. Once completed, we licensed the films to various broadcasters through international distributors to make the money back. It is a tough, risky way to make money. Some would say it's actually a bad way to make money, but a good way to lose money. At one point, our distributor owed us about $100,000 for several deals they had made on two of our films. The distributor went bankrupt and we never saw a dime. It set back my career about 5 years. I had to take a job to make my mortgage payments. Ironically, I ended up as an adjunct college professor teaching video production—something for which I had no formal training, but in which by that time had a large amount of experience. In 1999 I met my future wife, Christine, through a Boston dive club. She immediately had my respect because she was as good a diver as me (maybe better). I distinctly remember shore diving with her in Hawaii early in our romance where I was concerned about the heavy surf and her ability to get ashore safely. She not only made it there safely, but beat me to the beach and then asked “What’s taking you so long?” That’s my kinda girl! In 2000, while working with Tom Krasuski, Art, Gator and Christine on a film about shipwrecks that ultimately lost a lot of money, I had an idea for a kids series about the underwater world. I wanted to find a whacky scuba diver host and direct a show where we would travel all over the world investigating ocean mysteries, exploring amazing places and meeting cool animals. Christine suggested that I was pretty whacky and maybe I should be the host. But then who would shoot the show if I were the host? We came up with an idea where the host (me) would be exploring the ocean, so the story would be told through my perspective as a cameraman, and through my footage. Of course that meant we needed a second cameraman to get shots of me getting shots of the critters. Tim and Gator both volunteered to help as much as they could. Art and I started pitching the idea to networks. They all told us that without a sample reel of the host, they wouldn't be able to tell us if they were interested. We decided to make a pilot episode to shop around so people could get a feel for the way the show would look and how they would like me as a host. After some brainstorming, we decided to adopt the Chronicle format, with each half-hour episode containing three separate stories, each about 7-9 minutes long. Since we had a lot of Blue Shark footage from Rhode Island already shot from Beneath The North Atlantic, we decided to make our first segment about Blue Sharks. We set up a shoot, chartered a boat and called Tim Geers to be our second cameraman. We went out and shot for a day and put together a very nice segment about me learning to tag sharks. It was local, inexpensive and really cool. We went down to Florida and stayed at Tim's mom's house for a couple nights to shoot a segment about Ginnie Springs. And I had a dive trip planned to Dominica for a promotional video I was making for a dive operation, so I spent a few extra days and did a segment on Sperm whales. In 2001, once the segments were edited together, we finally had a pilot and we called it Jonathan Bird's Blue World. The original pilot had the classic opener "Hi, I'm Jonathan Bird and Welcome to my world" at the beginning, which Tim and I brainstormed standing on the shore in Gloucester, Massachusetts, with waves breaking over the rocks, trying to keep the camera dry. His kids, at the time about 12 years old, were holding the reflector and microphone. The pilot episode was pretty good, and in fact won a CINE Golden Eagle award. We showed it around to anyone that would watch it, and even did a test screening at the New England Aquarium Dive Club. People agreed it was a great show. We were sure that once some networks saw our pilot, they would buy into the series. It didn't quite work out that way. Discovery Channel told us it was "well produced but too educational" and we didn't get a better response from any other networks. Two different agents of ours worked on selling it, and finally gave up. Tim urged me not to give up. He insisted that Blue World was our best work yet, and sure to be a hit. I was depressed about it. In 2003, I was teaching a course in underwater videography in the Cayman Islands and my star student was a Canadian named Pierre Séguin. Not only was he naturally talented with a camera, he paid attention in class and really absorbed the material. He and I are both complete goofballs, so we hit it off well and dove together all week. Soon, we were diving together in other places like two pals that have been friends since childhood. He came to be one of my best friends, and our other main cameraman, along with Tim. We briefly tried to call him "Cameraman Pierre" and he absolutely hated it, so Pierre has no goofy screen name--he's just Pierre! In late 2003, Art and I got a contract to shoot a film about pelagic sharks for National Geographic Channel. For two years, Gator and I trekked all over the world, with Tim's periodic assistance, shooting this film. Not only was it a terrific amount of fun, we were also shooting new Blue World segments along the way. Once the finished film, called Sharks of the Ocean Desert was delivered to National Geographic in 2005, I turned my attention to another project I had been wanting to try: a feature length documentary about life on a coral reef that would be shot extensively on the same reef for several months. Secrets of the Reef was a long and complicated project that utilized over a dozen friends acting as volunteer film crew to keep the project costs down. Pierre and Gator both came out to help shoot it. Julia Cichowski, a friend for many years, and a fabulous diver, decided to take a leave of absence from her high-powered job at an investment firm to spend 6 weeks in the Philippines acting as the production manager and diving every day. I soon realized how great it was to have someone as organized as Julia running a shoot. She didn't know it yet, but she was going to be working with Jonathan Bird's Blue World if it ever got off the ground. In late 2006, with Secrets of the Reef still in production, I decided to start editing some of the new Blue World segments I had shot with Gator and Tim during the shark film. We would start putting the individual segments on the internet as webisodes. We included study guides for educators and sent out press releases to let the world know that our show was available free on the internet. Maybe it was too educational for Discovery Channel, but some people, such as teachers, actually like educational programming and I refused to let the idea die. Besides, Tim wouldn’t let me. The website launched in early 2007 and Jonathan Bird's Blue World very quickly attracted attention in the educational community. We got an endorsement from the National Educational Association and the National Science teachers Association. We were featured by PCMag.com as "one of the top 10 internet shows to watch during the writers strike" where they warned viewers: "Be careful, you might learn something!" We put the webisodes on YouTube.com and we soon were featured on the top page for a day…getting an incredible 75,000 views in 24 hours! It was great fun. We couldn't figure out how we would ever get any money for the show so we could shoot more, but it was neat to see people watching and enjoying the effort we had put in. Just as we were trying to figure out a business model for a means to keep the show in production on the internet alone, my phone rang. It was the program director from NETA, a public television syndicator, asking how come this show wasn't on public television? She wanted as many half hour shows as we could make…as soon as possible. We had enough material for 5 shows (15 segments at 3 per show) but they weren't all edited! My friends Kerry and Linda Hurd (also divers) volunteered to help with the editing—a huge task ahead of us. After months of editing divided between Art, The Hurds and me, we had a finished first season of Jonathan Bird's Blue World. They began airing on public television in May, 2008. With only 5 shows, we didn't expect many affiliates would air the show because it's hard to convince station program managers to make room in a broadcast schedule for so few programs. Yet by the end of the year, we reached 37% U.S. market saturation. That means 37% of the households with televisions were able to watch the show. We were thrilled, but not surprised. We always knew the show was great and just needed an audience. This success spurred us to action to make more shows. The problem was: where would we get the money? Making underwater natural history programs is not cheap. The problem is that public television stations do not actually pay for programming. You have to give it to them for free. Underwriters (companies or grant-making organizations) pay for the programming and then get credit in the form of a short sponsor announcement at the beginning and end of each show. We needed to find an underwriter that would be interested in supporting our program. Christine, Julia and I began brainstorming and I started making calls. We were lucky to eventually find Ian's Natural Foods, with its headquarters only 20 minutes from my house. They make healthy, fun food for kids, and seemed like a good fit for an educational show like ours. They listened to our proposal, watched the season 1 DVD and decided that they wanted to get involved. Soon, we were off and running shooting season 2 of Jonathan Bird's Blue World, in HD with Christine as executive producer and Julia as line producer. Pierre, Tim, Kerry, Linda and Art worked very hard on the new season with me. Somewhere in the beginning of the production of Season 3, Art called me and asked if we needed an intern. We have taken on a few interns here and there, but for the most part we have a hard time giving interns a good experience since the work we do is so eclectic and we don't work like a traditional production house with a full-time editing staff and a daily office routine. I was hesitant to take on an intern, but Art insisted that he had a student in one of his classes that was perfect for us. Tim Howe showed up soon thereafter, a master of After Effects and computers in general, as well as eager to learn more about the aesthetics and style of editing. One of his first assignments from me, to test his abilities, was to rough cut a story I had mapped out with a simple outline. That rough cut ended up as Yucatan Sinkhole, and he did a great job, greatly exceeeding my expectations from an intern. As the season went on, "Intern Tim" started adding his own ideas to the style of the show, making the editing a little more snappy and fun, taking us away from the very traditional "BBC style" of the first two seasons. He wasn't certified to dive, so we started taking him on shoots as a sorely-needed "surface cameraman"--someone who would always be there on the boat when the divers surfaced, catching all the action. We joked that we had more underwater camera operators than we needed and if he got scuba certified, we would fire him! Tim finished his internship with us but we couldn't let him go. He stayed on after graduation from college part time and starting taking over my role as primary editor. And since he was no longer an intern, we had to start calling him "Editor Tim" to distinguish him from "Cameraman Tim." Later he finally did get certified and that will actually appear in a Season 5 segment. Editor Tim is not only a great friend but a world-class editor and is becoming a very good underwater cameraman too. Cameraman Todd joined us around the same time as Editor Tim. Todd is a diving friend of mine going back many years, and he has been diving longer than any of us--we was actually certified at age 12! Not only a man of many talents including chemist, software engineer and lawyer, but also a skilled underwater still photographer. He started shooting with Blue World in season 3 and has become a regular member of the team. Of course he needed what has become a "traditional" Blue World name, so he is known affectionately to the team as "Cameraman Todd." Yeah, we are clever like that. Because Todd is cave certified, he has been our go-to cameraman for all the recent segments that involve cave diving. In seasons 3 and 4 we welcomed the Guy Harvey Ocean Foundation as our primary sponsor and the National Science Foundation with additional support. To us it was extremely satisfying to know that we were making the program we set out to make--educational enough to receive NSF support but also exciting and well-produced enough to win Emmy awards. The show has won 8 New England Emmy awards and has been nominated for a National Daytime Emmy award three years in a row now! Now, as we begin season 5 production, I can tell you this—I'm still just as passionate about the ocean as ever and we have no plans to stop producing the program anytime soon. We've had many grand adventures shooting seasons 2, 3 and 4! We are already starting season 5 shoots and looking forward to producing them because we just can't get enough of the amazing underwater adventures we have in flming them.